Inventory We are a resale marketplace, not a box office or venue. Ticket prices may exceed face value. This site is not owned by Radio City Music Hall . Radio City Musical Hall has been one of the premier entertainment destinations in the world since opening in 1932 in New York City in the Rockefeller Center. The Radio City name was derived from the first tenants the Radio Corporation of America. 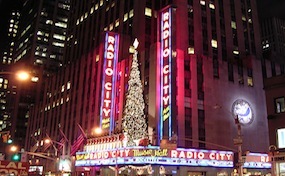 Radio City Music Hall has hosted the Radio City Christmas Spectacular as an annual holiday musical production since 1933 featuring the dance team known as The Rockettes. The seating capacity is 5,933 for most shows. Radio City Music Hall has hosted the some of the biggest events on television including the Grammy's, the Tony's, the MTV Video Music Awards, and the ESPY Awards. Many of the most famous performers in the world have performed on the Radio City Music Hall Stage including Frank Sinatra, Bill Cosby, Tony Bennett, Barry Manilow, Sting, Bette Midler, Stevie Wonder, Ray Charles, Sammy Davis Jr, and many more. Radio City Music Hall Box Office is currently managed by Madison Square Garden, Inc. To purchase tickets to any Radio City Music Hall events simply click the view tickets button on this page to browse all available inventory. MusicHall-NY.com is an independently owned and operated site that sells secondary resale inventory to all events throughout the world. We are not affiliated with any primary box office, venue, and or official website. Prices on our site reflect demand and may be above or below face value. To order tickets to all Radio City Music Hall New York events follow the steps online through the checkout or call our friendly operators at anytime.